Charly Cox is a writer, producer and poet. Her writing focuses on destigmatizing mental health and the coming-of-age of a young woman surviving the modern world. In January 2017, she published her first poem on Instagram, showing her internet followers her poetry for the first time; since then she’s been asked to be Virgin Radio’s poet in residence, she’s been published on Refinery29, hosted poetry nights to raise money and awareness for MQ Mental Health and been named by ELLE magazine as one of their 20 power players to watch out for in 2018. She Must Be Mad is Charly’s first book. Brave and beautiful.' Stylist Magazine Social media's answer to Carol Ann Duffy' Sunday Times STYLE Divine.' 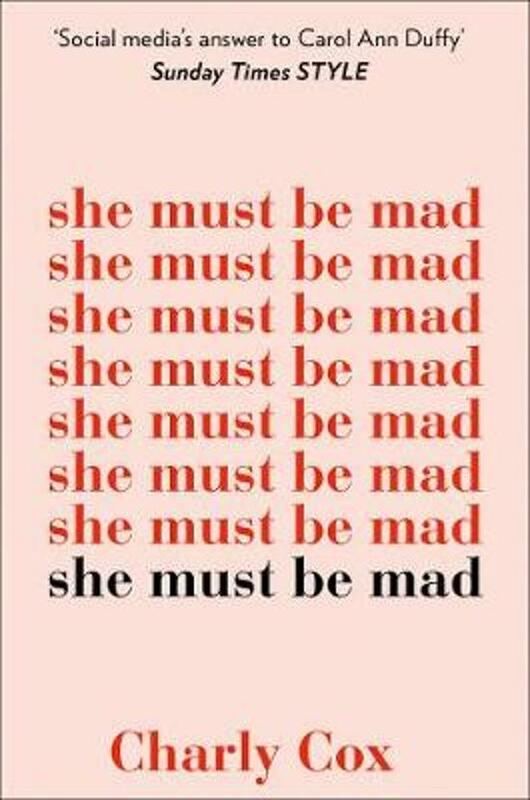 Cecelia Ahern She Must be Mad explores coming-of-age: the pain and beauty of love, the relief and the agony of turning from girl to woman, the isolation of an untethered mind and the power and subjugation of the body. Charly captures the formative experiences of today's young women from the poignant to the prosaic in writing that is at once witty, wry and heartfelt. Wayward nights out that don't go as planned; the righteous anger at those men with no talent or skill or smarts who occupy the most powerful positions in the world; the strange banality of madness and, of course, the hurt and indecision of unrequited love. For every woman surviving and thriving in today's world, for every girl who feels too much; this is a call for communion, and you are not alone.